The painkiller ibuprofen and the cancer drug toremifene can disable the Ebola virus, say researchers. Scientists used the UK's national synchrotron facility - Diamond Light Source - to analyse the virus in incredible detail. 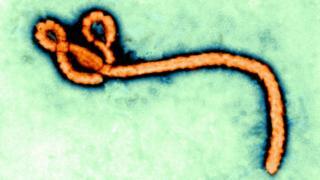 They revealed the two drugs could bind to the crucial part of Ebola that the virus needs to infect cells. However, the team warns this is just a starting point and more effective drugs need to be researched. The synchrotron accelerates electrons until they produce very intense light. This can be used to analyse the atomic make-up of objects at a much greater resolution than traditional microscopes. The focus of the researchers was a protein on the surface of the Ebola virus that allows it to infect a cell. "This is the main target on the viral surface, this is the one responsible for attaching to the cell, it's the key protein to understand," said researcher Prof Dave Stuart, from the University of Oxford. The structure, which has been reported in the journal Nature, can already be used to design new drugs. There are no drugs to change the course of an Ebola infection. And the need for new medicines was highlighted in the Ebola outbreak in west Africa in which 28,616 people were infected and 11,310 died. The researchers also used the Diamond facility to investigate how some current drugs interacted with the protein. Toremifene, and to a lesser extent ibuprofen, triggered the protein into prematurely thinking it had attached to a cell. Prof Stuart told the BBC News website: "They destabilise the protein. It [the protein] has one shot at it, and if it doesn't hit the target then those viruses would be inactivated." Both drugs have a relatively weak effect so are unlikely to be useful treatments themselves, as huge, toxic, doses would probably be needed to affect the course of an infection. "It's unlikely these compounds, as they are now, would be useful drugs for Ebola," Prof Stuart said. "For an effective drug, you would want to increase the binding strength significantly. "But seeing how they bind could allow stronger binding compounds to be developed using standard techniques."